The Zodiac Killer was a serial in the 1960s-1970s in California that was/is unknown and never found. His copycat killer was found in New York (New York Zodiac Killer - see below) and is currently in prison. The Zodiac killer comes in second for unsolved serial killers, first place is Jack the Ripper. He killed and attacked people between December 1968 - October 1969 in Lake Berryessa, San Francisco, Vallejo and Benicia. He sent letters about the killings to local newspaper companies until 1974. He stated "I like killing people because it is so much fun," in one of the letters. He believed that everyone he killed will be his slave in their afterlife. His letters would include symbols to decipher, of which only one has been solved. The police investigated over 2,500 potential suspect but technology was not advanced enough to identify the killer. August 17, 1990 - The Exorcist III - The "Gemini Killer" was loosely based on the Zodiac killer. November 19, 1993 - The Addams Family Values - The Zodiac killer trading card is mentioned in the movie. The Zodiac was a serial killer in California during the 1960s - 1970s. He was never caught and is still at large. Riverside Police Department received a letter from Bates" killer that was types with a Royal typewriter with an elite type. Police found the same kind of typewriter during a search of Allen"s home in February 1991. Allen worked a few minutes away from where one of the first victims, Ferrin lived. It was also where one of the murders happened. Allen wore a Zodiac brand wristwatch. Allen was cleared of being a suspect for the Zodiac killer after partial DNA from stamps and envelopes of the Zodiac killer letters did not match his. Don Cheney was cleared of being the Zodiac killer also. He was Allen"s best friend and report to authorities that he has suspicion of Allen being the Zodiac killer. Both of them was freed of any suspicion although authorities are not sure if the DNA from the stamps and envelopes are of the Zodiac killer. "Dear Editor, I am the killer of the 2 teenagers at Christmas at Lake Herman and the Girl last 4th of July. To prove this I shall state some facts which only I & police know. Brand name of ammo was Western." "I LIKE KILLING PEOPLE BECAUSE IT IS SO MUCH FUN IT IS MORE FUN THAN KILLING WILD GAME IN THE FORREST BECAUSE MAN IS THE MOST DANGEROUS ANAMAL OF ALL TO KILL SOMETHING GIVES ME THE MOST THRILLING EXPERENCE IT IS EVEN BETTER THAN GETTING YOUR ROCKS OFF WITH A GIRL THE BEST PART OF IT IS THAT WHEN I DIE I WILL BE REBORN IN PARADICE AND ALL THE I HAVE KILLED WILL BECOME MY SLAVES I WILL NOT GIVE YOU MY NAME BECAUSE YOU WILL TRY TO SLOI DOWN OR STOP MY COLLECTING OF SLAVES FOR MY AFTERLIFE EBEORIETEMETHHPITI." "This is the Zodiac speaking. By the way have you cracked the last cipher I sent you? My name is --" followed by a 13-character code, and was signed off with the crossed-circle symbol. In the letter, the Zodiac claimed to have killed 10 people to date. On 28 April 1970, the Chronicle received a greeting card from the Zodiac threatening to place a bomb on a bus and also asking for Zodiac buttons to be made. "I would like to see some nice Zodiac butons [sic] wandering about town. Every one else has these buttons like [peace symbol], black power,... etc. Well it would cheer me up considerably if I saw a lot of people wearing my buton [sic]." 1977 - The Zodiac Killer: Still At Large - Written by Cliff Smith Jr. The Zodiac claimed that he murdered 37 people in letters he wrote to several newspapers. Officials are approving only seven victims because they are proven and two people from the seven victims survived his attack. December 20, 1968 - David Arthur Faraday was shot and killed at age 17. December 20, 1968 - Betty Lou Jensen was shot and killed at age 16. July 4, 1969 - Darlene Elizabeth Ferrin was shot and killed at age 22. September 27, 1969 - Cecelia Ann Shepard was stabbed and killed at age 22. October 11, 1969 - Paul Lee Stine was shot and killed at age 29 in Presidio Heights, San Francisco. Betty Lou Jensen and David Faraday were on their first date when they were shot and killed by the Zodiac killer on Lake Herman Road. After visiting friends and having dinner at a restaurant, the couple drove to a place called "lover"s lane"" by the teenagers. Robert Graysmith said in his book that the Zodiac killer pulled into "lover"s lane" and parked beside Betty and David. The couple exited the car and the Zodiac killer shot David in the head as Betty ran. He then shot Betty five times in in her back when she was 28 feet away from the car. Darlene Elizabeth Ferrin and Michael Renault Mageau went to Blue Rock Springs Park in Vallejo a few minutes before midnight. The Zodiac Killer parked behind the couple"s car and exited his car with a flashlight and a 9mm Luger. He shot the couple a total of five times while they were still seated in their vehicle on July 4, 1969. Several bullets went through Mageau and into Ferrin. The killer heard Michael moaning and returned to the car and shot each of them twice. Darlene died upon arrival at Kaiser Foundation Hospital. Michael survived being shot in the face, neck and chest. June 4, 1963 - Robert Domingos was shot and killed at age 18 on a beach near Gaviota. June 4, 1963 - Linda Edwards was was shot and killed at age 17 on a beach near Gaviota. October 30, 1966 - Cheri Jo Bates was 18 years old when she was stabbed to death at Riverside City College in Riverside. March 22, 1970 - Kathleen Johns was 22 years old when she was abducted and escaped. Donna Lass was 25 years old when she went missing since on September 26, 1970 in Stateline, Nevada. Her body was never found. Heriberto Seda was 22 years old when he was arrested on June 18, 1996 for shooting his sister and shooting at officers. Heriberto shot his sister Gladys in the back after they got into an argument. She escaped and ran into the neighbor"s apartment where they called the police. Heriberto opened fire on the police officers responding to the call. Heriberto gave himself up after several hours and was fingerprinted. His fingerprint matched that of the Zodiac killer. He had a trial on May 15, 1998 in Queens, New York that lasted for five weeks. Heriberto plead guilty and was convicted of murder and attempted murder on June 20, 1998. He was also convicted of being the New York Zodiac Killer. The jury found that he had nothing to do with the Zodiac Killer in California because of his age. He was sentenced to 152 years in prison and had to serve 83 years in prison before he is eligible for parole. May 31, 1990 - Joseph Proce was shot on May 31 and died on June 24, 1990 at age 78. June 21, 1990 - Larry Parham was shot and survived. August 10, 1992 - Patricia Fonti was shot and killed at age 39. July 20, 1992 - Joseph Diacone was 40 years old when he was shot and killed. 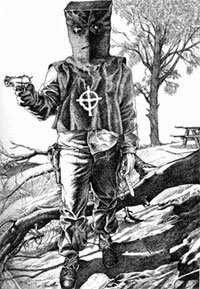 Below is Robert Graysmith"s sketch of the Zodiac killer as he appeared during the attack at Lake Berryessa. The sketch is based on Brian Hartnell"s eyewitness account. Zodiac Killer serial killer is a male serial killer.